The W has produced outstanding alumni in many fields, including the culinary arts. Chef Linkie Marais, a graduate of the MUW Culinary Arts Institute, has found success after appearing on Season 8 of “The Next Food Network Star,” lasting six episodes into the series. On March 19, Marais came back to the W to serve as Guest Chef for an international luncheon, featuring cuisine from her native South Africa. The menu consisted of bobotie (spiced ground beef with an egg topping) with yellow rice and fruit chutney, curried orzo salad with dried fruits, rack of lamb with roasted vegetables and boere boontjies (mashed potatoes with green beans,) malva pudding with spiced ice cream and chilled basil rooibos tea. Though all of these dishes are of an upscale nature, they hearken back to Marais' early culinary experiences. The luncheon was run primarily by the Food Preparation 2 classes, and more than 40 people were served the four-course meal. In addition to serving as executive chef for the luncheon, Marais also gave a cake decorating demonstration to the Advanced Baking 2 class. Marais immigrated to the United States in 1999 and settled in Tupelo with her family. As a teenager in Tupelo, she got a job as a cake decorator. This experience, along with helping her mother in the kitchen, drew her into the culinary arts. 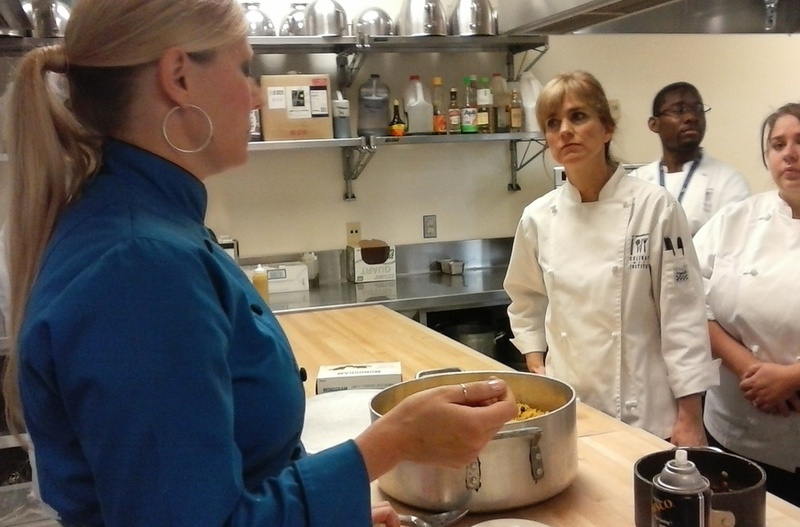 When Marais was searching for colleges, she happened upon the Culinary Arts Institute. “I came to do a [campus] tour, and I didn't even know they had a culinary arts department, and when I saw the culinary arts department, I was like, 'that's where I want to go,'” said Marais. At the W, Marais had a great experience. “I loved it. I sometimes was working until 11 o' clock at night testing recipes,” she said. She discussed the amount of influence that the culinary arts faculty had on her career, and the quality of her education under them. “My instructors were awesome,” said Marais. She also mentioned how much the program had grown since she graduated, saying that luncheons used to be held in the demo kitchen, and that the whole dining room area in Shattuck Hall didn't exist. Marais' success is beginning to bring some recognition to the Culinary Arts Institute. Ogle also expressed his gratitude that Marais continues to be involved with her alma mater. Ogle also said that Marais usually comes back to the W at least once a year, sometimes more. Her presence, and the opportunities it brings, are appreciated by culinary students as well. Marais advised current culinary students and those considering culinary school to test recipes from the beginning of their studies onward, and to take pictures of all their work and place them on social media. “That [social media] is your portfolio in this era,” she said. The MUW Culinary Arts Institute was founded in 1996, and provides an interdisciplinary instruction in the culinary arts. Students learn classic techniques and gain a knowledge of food service, as well as preparing for employment in various fields including food journalism, food art and food styling, nutrition and entrepreneurship.